Jumbo Empanadas: Happy Valentine's Day! Is it a Hallmark holiday? Yes. Is it horribly cheesy? Yes. Does it put ridiculous pressure on guys to come up with something romantic for the girl in their lives? Yes. Does it make girls feel bad if they if they don’t have a boy to celebrate with? Yes. Is it avoidable? No. So if you can’t beat ’em, join ’em and you might as well eat cake while you’re doing it. 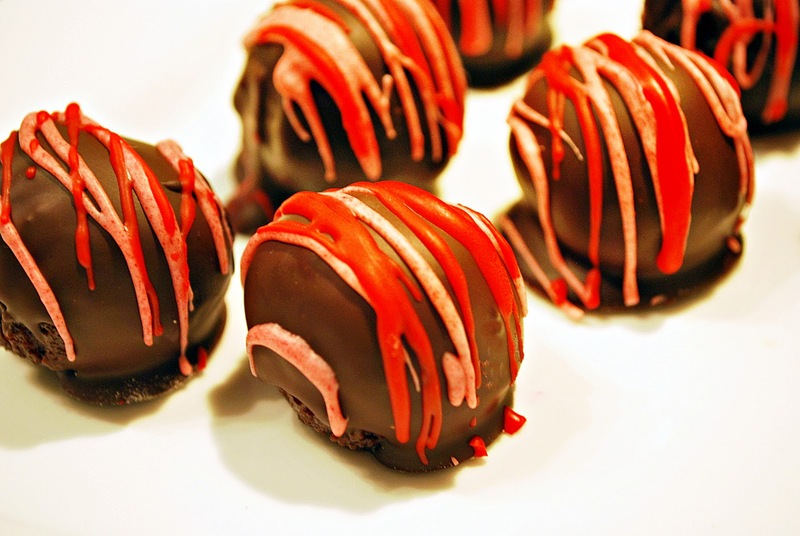 Food is generally the best part of any holiday and Valentine’s Day is no exception. It’s one of the only days of the year where it’s totally acceptable and justifiable to cram your face full of chocolate and ice cream and sweets. It’s definitely my kind of holiday. Regardless of how you feel about Valentine’s Day, you’re still going to see red and pink hearts everywhere and read mushy cards and hear love songs on the radio, so you might as well embrace it and do what I did. I invited my friend Ruby Clicks over for some wine and cake ball making, which translated into eating a lot of mashed up chocolate cake with cream cheese icing, reminiscing about our travels and then going out for a candlelit sushi dinner complete with hearts on the plate. What’s not to like about that? As a bonus, Ruby takes really pretty pictures and was able to help me sort out why my fancy camera was acting up. It seems that the auto-focus is broken, (sadface) but that I can still take pictures using manual settings until a life sponsor swoops in to fix things… I think I’ll be struggling with this one for a while, bear with me. 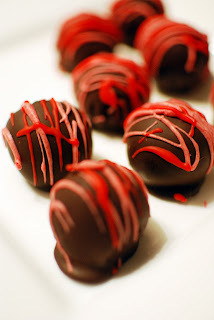 If you want to get into a festive Valentine’s Day mood, The Kitchn has a great recipe and tutorial for making cake balls. If you plan on making your own cake and icing, (which you’d be a fool not to) the whole process is somewhat time consuming, but I like that. You could mix and match cake and icing flavours to your heart’s content but chocolate seemed very appropriate for Valentine’s Day and cream cheese icing is appropriate for everyday. 1- Dulce de Leche Day is coming soon, February 28th, so start planning your recipes. For more info, click here. 2- In the words of the great 50 Cent- “I love you like a fat kid loves cake!” Happy Valentine’s Day everyone! Posted by Brilynn at 4:25 a.m.
You're right it's only good with cake :D I made some Valentine's related baking too, a heart shaped bread and heart brownies&blondies for..haha.. Awesome! I love these and these are fail proof gifts indeed! Sorry to hear it's broken, however it's always good to learn the manuals. You may end up taking better pictures! : ) What kind do you use, if you don't mind me asking? Also, these turned out very beautiful.